I recall when I was young down at the Devonport (Auckland) wharf, watching people with big nets hauling in copious amounts of tiny fish. You could peer down into the water and see masses of them swimming around the poles that supported the wharf. So many were caught that the value was minimal and you can only eat so many of them. Some people would take them home, dig trenches and use them as fertiliser, a practice that disgusted my parents. They were not knowledgeable conservationists but they understood excessive harvesting of any animal is not sustainable, but especially morally wrong. The creature in question is the whitebait, which are immature fish fry. They often travel together in schools, presumably for protection. They are a vital source of mature fish stock, which should be allowed to grow into full sized creatures if not for eating. The despicable practice of using them for manure or on selling has led to a shortage in New Zealand, forcing up prices to ridiculous levels. There is a season for catching them and limits on how you can catch them. These are often flouted by greedy private opportunists, who on-sell them for much personal gain. I would have thought banning private selling would reduce the catch and lessen the rule breaking harvesting. I have no problem with catching whitebait if it for personal consumption. While they are quite tasty, I could live without them and have for many years. I recently had some given to me by a person who refuses to make money from them, sharing with friends on occasions. I wish there were more Kiwis of that disposition. 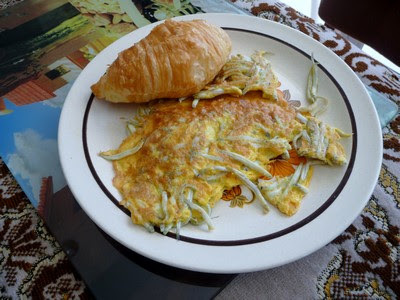 Fried with egg and in this case with a croissant (unusual I admit but it worked), a pleasant lunch time treat. That said, I would happily see a ban on their catching altogether if fish stocks were being harmed. Those who abuse the privilege of responsible fishing of these tiny creatures may cause that to happen one day. Greed simply isn't sustainable.